It was in early December, 1854 when the propeller Westmoreland’s wooden hull opened in the midst of a severe winter gale on Lake Michigan and the ship sank in Manitou Passage. Two lifeboats got away successfully but one boat got crushed by the sinking steamer as it overturned, taking 17 passengers and crew members down with it. There were a total of 33 people on board when the Westmoreland left Chicago. Among the survivors was Clinton Wright, the ship’s chief engineer, who told his graphic story of the disaster to a local newspaper, probably in Milwaukee, and it was reprinted by most newspapers along the coast. This account was found in the Buffalo Democracy on or about December 20. He said the Westmoreland, a 200-foot vessel under the command of Capt. Thomas Clark, left Chicago on Saturday, Dec. 2, bound for Mackinac Island with a load of winter supplies and grain for the islanders. The vessel also reportedly carried a large cargo of liquor and some said it had gold in the safe valued today at over $100,000. Wright said the cargo consisted of 29,000 bushels of oats, 90 bales of wool, 1,400 barrels of flour, 50 kegs of butter, 200 dressed hogs, 160 quarters of beef and a quantity of barreled beef, pork and lard. He did not mention the liquor or the gold. He said the ship ran into heavy weather almost from the start, was taking on ice and consequently was laboring heavily. Then the storm developed on the sixth. The Westmoreland was now battling high winds, seas and heavy snow. The wooden hull on the one-year-old vessel began to leak, but Wright said the steam pumps were handling the water. The storm grew worse and by the seventh he said the leak was now getting ahead of the pumps. He said all hands were now called upon to start a bucket brigade in an old-fashioned effort to keep the water from reaching the fires in the engine room. They were not successful and eventually the fires were out. The ship was now adrift and at the mercy of the storm. When it began drifting, Wright said the ship was abreast of the point near South Manitou Island and only about two miles from shore. In fact, they were within sight of the light house. 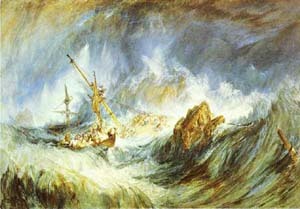 But the gale was blowing from the northwest and the vessel drifted about 12 miles out to sea. He said the crew apparently tried to use boats and row against the storm, pulling the ship to shore, but the undertow and wind worked against them. "After every attempt to get her in had proved unavailing, and no hopes were left of saving her, the boats were got ready for launching," Wright said. The first boat pulled away with Captain Clark, both engineers, two women passengers, one of the wheelmen, one deck hand and the cook. They pulled for about two hours but reached the island safely. He said the second boat brought the two mates, the watchman, one wheelman and "three Germans" and also reached shore. The third boat "got foul of the cabin in launching and upset. All in it perished." From the boats, Wright said the survivors watched the steamer slowly sink until it sank at about two or three o’clock in the afternoon, about twenty miles from the South Manitou dock. As it sank, he said they watched some of the men who had been in that third lifeboat clinging to the ship’s arches. They went down with the ship. As they came ashore, one of the boats was upset in the breakers and two of the people in it were drowned. Once ashore the men went back into the woods and built a wind break out of tree branches and got a fire going. That was where they spent the first three days and nights, huddling together near the fire and under the protection of the wind break while the gale raged around them. In the morning he said the beach was strewn for miles with barrels of flour, pork, butter and other flotsam from the wreck. They also found the third boat lying upside down on the beach. When the storm abated, the survivors launched the boats and started working their way along the shore toward civilization. But after being out only about two hours the wind came up and drove the two boats ashore. So another wind break was built and another fire, and they remained here another four days until the second storm passed. The mate and some of the men reached shore in one of the boats, then set off on foot, following the beach. They walked 90 miles before they reached the town of Manistee, Michigan. The others remained on the island for the winter, possibly reaching the light house.